In 2014 the Rwandan President Paul Kagame participated in the Kenya’s Jamhuri Day Celebrations. For those who dont understand what Kenya’s Jamhuri Day Celebrations means is like the Rwandan Independence Day. However, many Rwandans of my age and young have never had opportunities to celebrate their Rwandan Independence Day.This is because when we started knowing to differentiate colors, our beloved Rwanda had been invaded by the offspring of the Tutsi monarchy that our great parents had fought so hard to end their corvee and serfdom. These warmongers had already taken over and ended all things that defined Rwanda and Rwandans including the Rwanda Independence Day (La Journee National de l'Independence) the Jamhuri Day. One of the reasons that the Kagames abolished the Rwanda Independence Day is because the day marks the day which our great parents ended the Tutsi Brutal monarchy that survived on sucking blood out of our people's nerves. The Kagames weren't happy that the Tutsi Monarchy ended. This is why they fought hard to enslave Rwandans again. Just going back to the Little Kenyan Girl Wendy she reminds me how old I was when Kagame and his men descended in the Hills of Bwisige. Although I was too young I could notice the fear in my mom's face when we heard that the Anti-Hutu Tutsi rebels supported by Uganda and USA had arrived in the ridges of Bwesige. I knew something terrible was on its way to finish us. It did not take long bad news started overcrowding our ears. Two of my uncles living near Bwisige Primary School had been butchered by the Tutsi led rebels. We fled to Muhura and I was only 11 years old just like the Little Kenyan Girl Wendy Waeni the young gymnast who impressed the Rwandan Serial Killer Paul Kagame during her performance in Kenya’s Jamhuri Day Celebrations (Independence Day) in 2014. 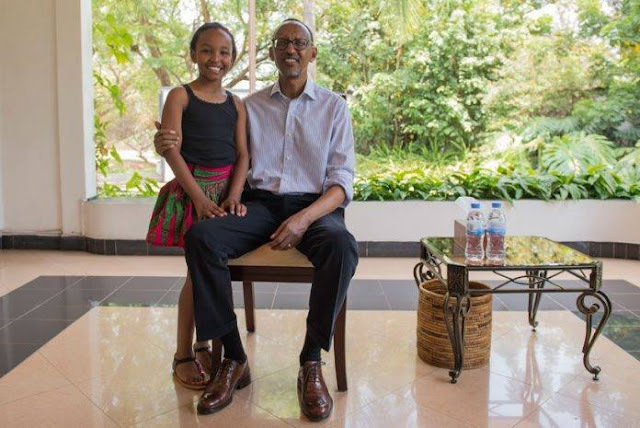 Her performance was so good it melted the rock hearted Kagame prompting President Kagame to extend an invitation to the little girl to visit him in Rwanda on a fully paid trip. To many people this sounds fantastic but I want to tell you a story that I share with most Rwandans. Kagame likes other people apart from the Rwandans themselves, especially the Hutus because he came to power after killing millions of them with the help from Uganda and USA. 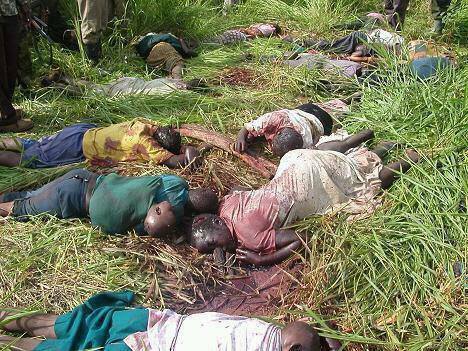 When I was 11 year old girl Paul Kagame killed almost every body in my family. The first casualty was my Grandma who was living in Kagitumba Village. She was killed by the Tutsi rebels led by Paul Kagame and leaving most of my agemate orphans. It has been 25 years now since the time a devil visited Rwanda in the name of Paul Kagame. Nw after killing more than 3 million Rwandans, Mr Paul wants to appear softhearted. That lie can be bought by other people who are not Rwanda but not the Rwandans because we know him in person. Dear Waeni finally although you waited for two good years to come to Rwanda and see how our streets are clean unlike the crowded streets of Gikomba and Wakulima Market, at least your dream came true. You saw the cleanest roads of downtown Kigali, especially in Kiyovu where Mr. President Kagame lives. However, I wanted to also orient you about my County Rwanda of which I strongly belive that Paul Kagame and his group couldnt find time for this for you. 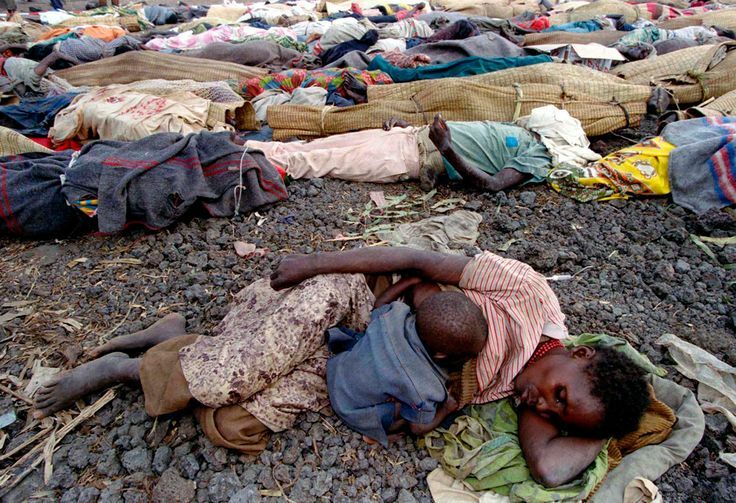 WHEN THE TUTSI REGIME IN RWANDA SUPPORTED BY US AND UGANDA INVADED HUTU REFUGEE CAMPS AND SLAUGHTERED MILLIONS OF RWANDAN HUTU REFUGEES IN 1996. When you boarded the plane on September 9th to the East African nation to meet the Rwandese ruler Mr. Paul Kagame, the same day women had already barricaded different roads in the Kigali streets. Maybe you didnt hear this or see it because you were in the most secured place in the country. However, your buddy Paul had a shield around his chest because he always daydream about the guys coming for his life. Dear Wendy, if you cam too close to Mr. Kagame and heard something hard like a metal pressing you, dont worry, here in Rwanda we are used to our president walking like a scarecrop stuffed with all sorts of things such as Mitumba or what we call Caguwa here in Rwanda. All this is done to protect our president who has ruled over Rwandans for 22 years with an iron fist. Dear Wendy, you are so lucky you were born in a country where every Kenyan is entitled to the same right here in Rwanda the story is different. The Bantu people are the second class citizens and are not allowed to walk in the streets of Kigali that is why you saw all roads cleans. Because if Mama Mboga ever tempted to hawk along the streets of Kigali will be shot dead by the Tutsi government. This is why you didnt see people hawking because most of the poor people in Rwanda are Hutus whereas the Tutsis are funded by their Tutsi government. They got all sorts of funds from the funds for school fees to the funds of buying underwears and G-String for the Tutsi ladies whereas Hutu women are killed on the streets of Nyarugenge while working hard to feed their impoverished families. I saw you on twitter today where your updates read:“I have waited this day for 2yrs and it’s finally here, starting my Rwanda’s visit today hosted by President Paul Kagame,” That happens only in Kenya. Here in Rwanda all social media are eavesdropped by the Tutsi regime. Any thing we post, especially if you are a Hutu it is listened too by the Tutsi regime, sometimes people are gunned down for tweeting that there is no water in their Nyumbakumi. If you think I am lying ask all Kenyans on social media what happened when Kagame was asked why he wanted to rule over us forever. Thank God there is a population called Kenyans they humbled him from that time whenever he comes to Kenya he is trading carefully because he knows that Kenyans dont buy his bullshits. As I conclude I wish you a fantastic stay in this land f our ancestors and know that Rwanda has the most oppressive rgime that came to power on the back of a Death Squad that killed more than 3 million people in order to arrive to power. Among those killed include Habyarimana Juvenal the former President of Rwanda in whose house you visited Kagame today. Cyprian Ntaryamira the former president of Burundi killed in the same plane that Paul Kagame shot down in order to come to power. Rwanda has more graveyards than its population. Majority of them were killed simply because they were Hutus (Bantus) and now they have been all pushed into the rural areas so that the streets of Kigali can look clean. One of the Hutu hawkers women was beaten to death by the Pro-Kagame Tutsis to keep the streets you see here in Kigali clean. That is the price Hutus have to pay everyday of their lives under Paul Kagame to survive. When you go back to Kenya salimiana sana and let them know that we are under oppressive regime of all times. ESE NI KUKI UMURYANGO USHINZWE GUHA ABATUTSI BA FPR UBUHUNGIRO MURI AMERIKA WITWA REFUGE POINT YAHOZE YITWA MAPENDO INTERNATIONAL IHISHA AMAZINA YABAKOZI BAYO? AHO SUKO ABENSHI MUBATANGA RESETTLEMENT ARI BA MANEKO BA FPR BAFASHA ABAHOZE MUNGABO ZA M23 KUJYA AMERIKA? Muminsi ishize twagiye tubagezaho ukuntu FPR ikomeje gukora iyo bwabaga ngo ihirike ingoma yabahutu mugihugu cya Burundi. Mubyamahirwe abatanzania baratabaye maze basubiza bwana Pierre Nkurunziza kubutegetsi muburundi. Iki cyari kimwe mubihano Tanzania yateguriye prezida Kagame nyuma yuko avuga kumaradio na televiziyo ko afite umugambi wo kwica Prezida Gikwete. Nkuko abatanzania basanzwe bikorera ibintu bucece Tanzania yatangiye umugambi wo guhana paul Kagame. Nibwo M23 yabatutsi yarigamije kwigarurira DRC yakubiswe incuro naho umugambi woguhirika Nkurunziza wari wateguwe na Abatutsi bo mu Rwanda babifashijwemo na Amerika wahise uhinduka amalira no kuganya bya Paul Kagame kandi nibindi bigikomeza. Abatutsi bashaka ngo gutegeka akarere indi myaka 500 noneho bakabikora muburyo bunononsoye. Kugirango bagere kwiyi gahunda basanze ntakundi byagerwaho uretse kugira umuryango munini muri America. Ibyo kandi bikaba biri muri gahunda yari yaratangijwe numugore wumunyamurenge witwa Mapendo Rose uba mubice bya Arizona mugihugu cya Amerika. Uyu mugore kandi yashinze organization yitwa Mapendo Internatinal ubungubu ikaba yarahinduye amazina ikaba isigaye yiyita Refugee Point nyuma yaho ibinyamakuru byo mugihugu cya Kenya nahano mu Rwanda bitangarije amahanga ko Mapendo Internaitonal ari umuryango ntutsi washiriweho gufasha abahoze ari abarwanyi bimitwr yabatutsi hano mu Rwanda no muri Congo harimo abo twita abademobe, abahoze muri CNDP, na M23. Izi gahunda kandi zikaba zikorwa muburyo bwibanga rikomeye aho abatutsi bahabwa akajambo kibanga mugabo bo nyene bagaca bakamenya ndetse bakamenyesha nabandi mega bava indimwe. 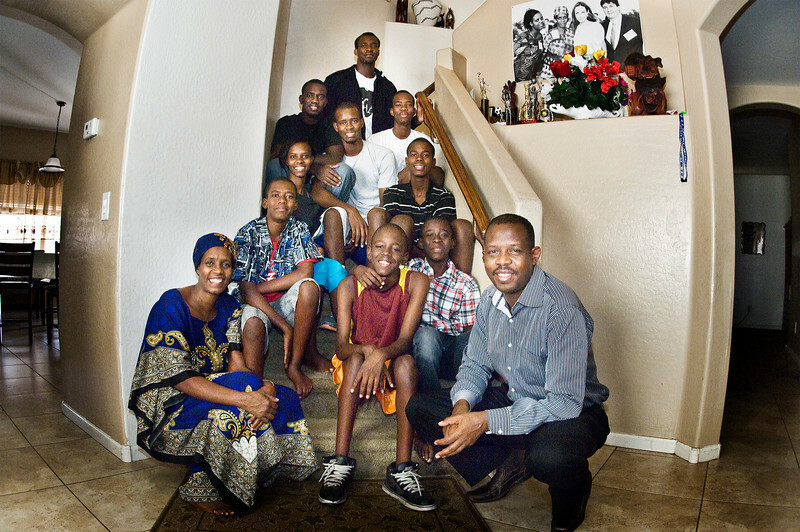 Iyo uri umututsi ushaka kujya muri America na Canada abagumyabanga babatutsi babanyamurenge baguha ijambo ryibanga uzavuga uli muri interview mugihugu cya Kenya aho ibiro Refugee Point bifite icyiciro. Iryojambo iyo ugeze nairobi bakohereza kubandi batutsi batuye mugihugu cya Kenya mukarere ka Umoja One, Kasarani, Donholm, na Kitengela. Ubwo abo bagumyabanga babanyamurenge rero bahita bashikiriza izina ryawe umwe mubahagarariye mapendo international (refuge Point) uba Nairobi iryo zina akazarijyana muri office yabo. Iyo umunsi ugeze rero ukajya mu bazwa ukoresha iyo jambo ryibanga. Akenshi na kenshi bakohereza kumugore ulimo ushinzwe gukurikirana ibyihahamuka wiyita umunyakenya kandi mubyukuri ari umuyarwandakazi wumututsi muba 1959. Uyu niwe wica agakiza ubuntidushaka kumuvuga amazina ariko ubutaha tuzayatangaza natisubiraho kuko limwe mumazina ye ritangizwa na "K". Iyo bamaze kukumenya rero ko uri uwabo batangira kugushira kuri program yitwa "urban refugee livelihood program." Iyi program abantu bayirimo kandi akaba anaribo bagena abajyanwa mumahanga bakaba banarigishijwe bihambaye uwo umututsi ariwe ndetse nuwo umuhutu ariwe nuburyo bagomba kubatandukanya baba muri group amazina yabo atemewe nagato gutangazwa kuri website ya Refuge Point. Niba mugirango turababeshya kuriyi taliki mwajya kuri website yabo muzasanga Refuge Point cg se Mapendo International dore ko bose ari bamwe yaranditse ko amazina yabashinzwe program ya urban refugee resettlement program adatangazwa ngo kubera umutekano wabo. Ikibazo si umutekano wabo ahubwo ikibazo ni uko abesnhi mubagize iyo program ari abatutsi. Abahoze ari abarwanyi ba FPR bakaza kugirwa abademob na bahoze bali mungabo za CNDP na M23 iherutse gukubitwa incuro na Tanzania mukarere ka Goma bakaza guhungira muri Uganda nomu Rwanda ubu bari kujyanwa muri Amerika kubwinshi. Nubwo harizindi mpunzi zabahutu bava muri Congo za Rutchuru na Masisi bo ntibahabwa uburyo bwo kujya mubuhungiro mubihugu byo hanze nubwo aribo bagize ibyago byinshi cyane bicwa ningabo zabatutsi za M23 na CNDP. Nkuko twabivuze haruguru nukubera gahunda ikomeye cyane ya FPR na HCR (UNHCR) igamije gufasha abatutsi bahoze mungabo kujya muri Amerika nkimpunzi zabanyekongo. Ibi byabanje gukorerwa muri program yitwaga Mapendo International nyuma bimaze kumenyekana iza guhindura izina nuko yiyitwa Refuge Point. Dore uko bigenda. 80% byimpunzi zituruka mu Rwanda zijya mubihugu bya Amerika ntabwo zikoresha amazina yazo yukuri. Ukuntu bigenda nuko HCR yu Rwanda ibifashijwemo na leta yu Rwanda ibaha andi mazina yabandi bantu bimpunzi zabahutu zagombaga guhabwa ubwo buhungiro kubera ibibazo zatewe na M23 ariko siko bigenda. Usanga abatutsi baza bitwa ba SEBISHIMBO, na MUJAWIMANA kandi ari abatutsi. Nkuko mwese mubizi hano mu Rwanda nta mututsi witwa ariya mazina kuko abesnhi bitwa ba Kabayija, Kamutesi, Kabano nabandi. Muti se bigenda bite. bafata aya mazina yabahutu ba za Rutchuru na Masisi bagombaga guhabwa ubuhungiro muri US bakayha abatutsi babo kandi bahoze mungabo zishe abahutu kubwinshi. Iya Refuge Point na HCR bamaze gucagura abo batutsi bagomba guhabwa ubuhungiro hanze bahoze muri M23 bahita bajyanwa muri Kenya gutegereza ko bajyanwa hanze. Ibyo kandi biorerwa munkambi zo murwanda zose ni za Uganda no mugihugu cya Kenya. Nikimenyimenyi ntamututsi numwe uba munkambi zimpunzi zo muri Kenya nka Kakuma kuko bose barihirwa amazu nibyo kurya mugihugu cya Kenya. Iyo RefugePoint imaze kubafata no kwemera ko ari abatutsi bahita berekezwa muri Amerika cyane cyane muntara za Maine, Texas, na California, na Arizona. Muri Texas haru umugi wabatutsi witwa Abilene ukaba anariwo ukorerwamo amanama yo koherereza amafranga abo muri M23. Bahurira munsengero zabo bateranije nabavuye za Arizona maze bagatanga amafranga yo gufasha M23 nokuyigurira ibyo kurya bavuga ko ayo mafranga agiye gufasha imfubyi muri Uganda no mu Rwanda ariko mubyukuri aba arayo kugura ibikoresho byo kwica abahutu. Ahandi hari abatutsi besnhi bavuye muri M23 ni muri leta ya Maine. Abatutsi bose bavuye Uganda no mu Rwanda bagenda bazi umugi wa Maine. Kuburyo ngo FPR yahafunguye nibiro bya ambassade bishinzwe gukurikirana uko izi mpunzi zabatutsi zikora muri aka karere. uyu mugambi rero ukaba unakangurira abana babasore bajya muri amerika kujya mugisirikali cya US kugirango bige ibya gisirikali mumugambi wo kwagura Tutsi empire. Ngayo erega abafite ubwenge nibumve se Abahutu bazumbaryari?